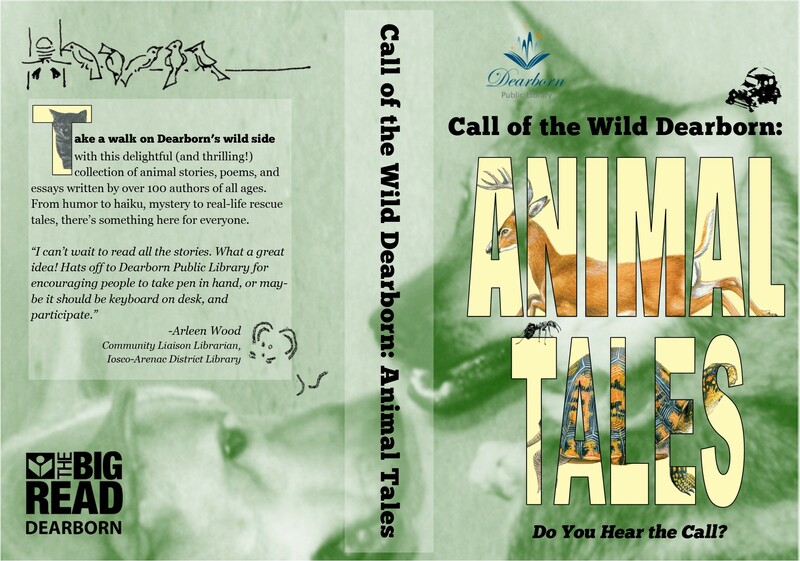 Call of the Wild Dearborn: Animal Tales is a community anthology featuring short stories, poems, and essays about animals, the environment, nature or wildlife. UPDATE, August 2014: Call of the Wild Dearborn: Animal Tales is now available for purchase! Take a walk on Dearborn’s wild side with this delightful (and thrilling!) community anthology featuring animal stories, poems, and essays written by over 100 authors of all ages. From humor to haiku, mystery to real-life-rescue tales, there’s something here for everyone. Proceeds benefit Dearborn Public Library. The paperback book is ready and available for purchase on CreateSpace or Amazon.com, but the library receives a greater percentage of sales when the book is purchased through CreateSpace. The Dearborn Public Library will also have some copies on-site for those who would prefer to purchase a copy at the library. We hope to have Kindle and Smashwords versions in the near future. A BIG thank you to all the authors who submitted stories and made this book possible! UPDATE, April 2014: The call for entries closed on March 1 and the call was answered in a big way! We have over 100 animal tales which will be published as a book soon. There will be an Animal Tales author meet-and-greet at the Wrap-up Party on May 17, 2014. Keep checking the website for updates. For now, we have a sneak preview of the cover for Animal Tales!